Seaton Tramway are offering great family days out in Devon starting from February half term. Join us for a ride through two beautiful nature reserves on our ‘Bird Hide On Wheels’. Or, if you’ve never driven a tram? Well, now’s your chance! Why not try your hand at a ‘Driver’s Eye Experience’ or one of our ‘Tram Driving Lesson’ packages starting from as little as £40 per person. Looking for something NEW this year? Seaton Tramway are excited to announce the arrival of not one, but THREE new family specials that are sure to impress! Easter welcomes the arrival of ‘The Fairy Special’ – a brand new Fairy Tram Ride for all to enjoy! Embark on a spellbinding trip as the Fairy Godmother takes you on a magical journey to the ‘Fairy Kingdom’. 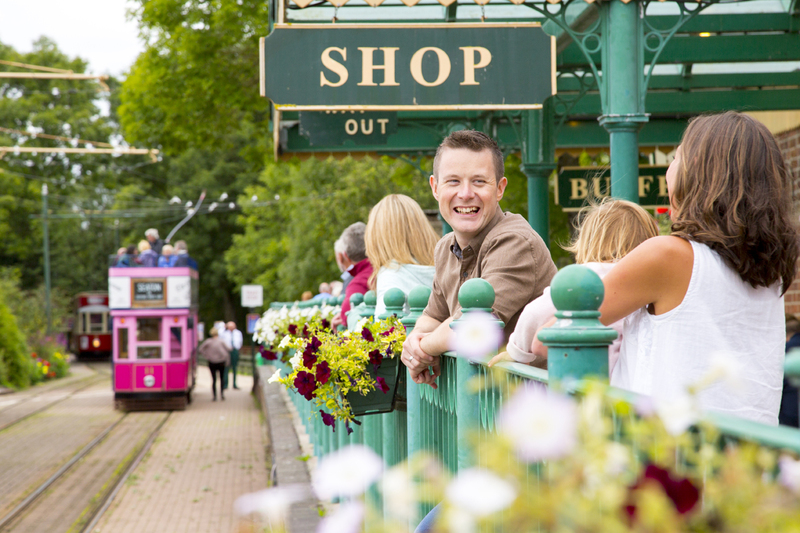 This enchanted tram departs from Seaton Terminus 8th April, 29th May, every Friday in August and the 1st September. Feeling adventurous? ‘The Dinosaur Tram Adventure’ is another exciting addition to the Tramway this year and families and children are sure to enjoy this adventure-filled tram ride with music, stories, fossil dig and dinosaur activity area at Colyton Station! Help Professor Percival the Palaeontologist uncover some secrets and fulfil a mission to make contact with some forgotten species. Departing from Seaton Terminus 16th & 23rd April, 1st & 28th May, 23rd & 30th July, every Sunday in August plus Bank Holiday Monday. Not to be missed this summer is the ‘Summer Fair & Dog Show’ on the 4th June, as well as the brand new ‘Pirate Tram’, where ye olde “Seaton Pearl” sets sail on her voyage following the Axe Estuary in search of some “booty” at Colyton Station! Shiver me timbers and all aboard for a swashbuckling time with Captain Nick, arrrgh! Departing from Seaton Terminus 28th July & 26th August. Seaton Tramway have organised a fantastic line up of evening events this year including a ‘Circus Themed Murder Mystery Evening’, music nights hosted by ‘Lazy River Jazz’, ABBA Tribute band – ‘Take A Chance On Us’ and the ‘Taunton Barbershop Harmony Club’, as well as seeing the return of the ever-popular ‘Allo Allo’ and ‘Dad’s Army’ evening events! Please see our website or give us a call for further information on prices, dates and times. During the autumn half term from Monday 23rd October until Sunday 29th October our Halloween ‘Tram of Terror’ will run from 10.30am – 2pm each day from Seaton to Colyton and back with lots of thrills and spills along the way! Not for the fainthearted is our Halloween “Tramtastic Spooktacular” Evening event on 31st October, where our most ‘gruesome’ drivers take passengers to meet Melchior Rattenbury, the mad butcher, and his band of Zombies at the haunted Victorian station in Colyton. Both events include horrible Halloween games and ‘revolting’ refreshments in the Garden Room and ‘Baddie Bags’ for the children. The Polar Express™ is once again coming to Seaton Tramway on selected dates between 1 – 24th December! Families will enjoy the magical tram ride to Santa’s home at the North Pole in one of the specially decorated single deck tramcars. Listen to and sing along with all the songs, be served hot chocolate and cookies by the dancing chefs and meet Santa and his happy bunch of elves. Each child will receive a special gift from Santa and you’re welcome to wear your pyjamas on board just like the movie! This event is very popular, so please book early to avoid disappointment. And don’t forget on most Fridays we offer a buy one standard ticket and get one half price when booked online, as well as offering £1.00 off per Explorer fare ticket when you book online at least 24 hours in advance! All tickets and Loyalty Cards can be purchased at the Seaton Terminus and Colyton Station ticket offices or online at: www.tram.co.uk. For further information please give us a call on 01297 20375. Previous Topic: Embark on a magical train ride and visit Santa Claus at his Workshop!